Pink is back and its making its mark this Spring. 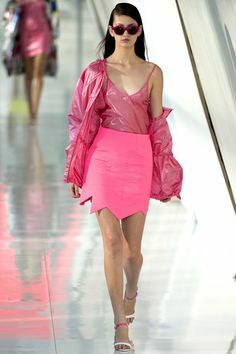 Designers such as Dior, Versace and Miu Miu all had models strutting down the catwalk dressed head-to-toe in bubble gum pink. At Burberry Prorsum it was pretty lace skirts worn with cashmere coats, while at Balmain it was a more edgy and structured looked, chiffon wrapped peplum dresses accessorized with chunky gold necklace and belt. Pink in my opinion is one of the easiest colours to wear, however you can end up looking a bit silly if over done. A nice pink silk blouse worn over a plain black skirt, can easily had that pop of colour to your outfit. Note: The darker your skin the more vibrant the shade of pink should be, but never forget to always add your own twist to any trend. Like Coco Chanel said, “fashion comes and goes but style is eternal”.